When our children were little we waited for the first hard freeze in the fall. On a cool, wet Saturday in late October or early November we headed south of Kansas City to a pecan grove near Pleasanton, Kansas armed with boxes and gunnysacks to carry our treasure. The farmer had a large clamp on the front of his Ford tractor. He attached the clamp around the tree. When he activated the machine the whole ground shook as if there were an earthquake and it did rain pecans. As soon as he backed off, all pickers swarmed in like hungry ants at a picnic. One year we picked a hundred pounds of pecans. Our next stop would be a few miles down the road. For five cents a pound, we could get the pecans cracked. Then the real work began—picking the meat out of the shells. The taste was much sweeter than the monster nuts we get from California today. Pecan pie has been a prized favorite in our family every fall. There is never a Thanksgiving or Christmas gathering without at least two pecan pies. Beat the eggs thoroughly with sugar, a dash of salt, corn syrup, and melted butter. Add pecans. Pour into unbaked pastry shell. Bake in moderate oven for 50 minutes or till knife inserted halfway between outside and center of filling comes out clean. Cool. Serve with a dollop of Dream Whip. 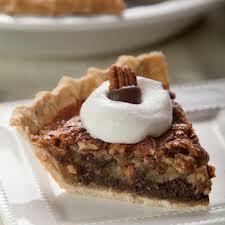 Note: To make it a Blackbottom Pecan Pie, add 1 cup chocolate chips to the bottom before you pour in the pecan batter. This looks wonderful, Sally! I cannot for the life of me – make a decent pecan pie. Give this one a try and tell me how it turns out. Anxious to hear.